Our latest launch Poseidon has been well received and is already featuring on vessels around the globe. Poseidon is an advanced software package that offers full customisation of data on up to 10 displays across the vessel network. Oceanic Systems (UK) Ltd is proud to launch Poseidon, the most advanced Alarm, Monitoring and Control System yet. Boasting state of the art vector graphics and PIN controlled user access, this system is becoming renowned for its simple user customisation capabilities. Oceanic Systems manufactures world-class marine systems for control and monitoring vessels, producing the latest advancement in the industry: Poseidon. This is a system that not only monitors and controls the vessel’s data but allows full user customisation which is unique in the industry. 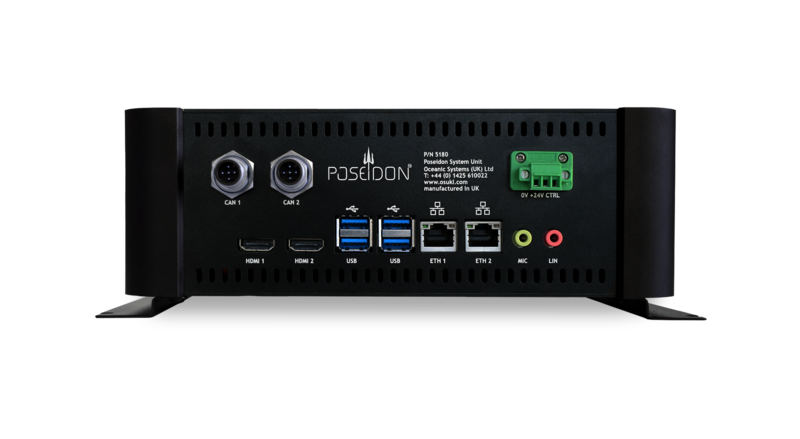 At the heart of Poseidon is the compact computer unit with a powerful Quad Core Processor, innovative heat pipe technology and with no moving parts to ensure durability in all marine environments. This system controls and monitors systems including, but not limited to tank levels, engines, AC power and digital switching, DC power and digital switching. It also controls and monitors temperature, bilge and fire detection systems, cameras, weather information and navigation information. Choose what you see as the customisation is limitless. Change the background of your displays, move, add and delete controls. The Poseidon library provides a wide range of pre-installed options to get you going. The system uses ‘drag and drop’ technology, ensuring simple user configuration throughout. The wide array of Poseidon’s options unite style and function, constantly evolving to meet the user’s requirements. Poseidon supports up to two primary helm displays and up to eight secondary displays elsewhere in the vessel across the network, all available from Oceanic Systems as BlackGlass high-resolution touchscreen displays. Available in sizes ranging from 10″ to 21.5″, these displays add pure class wherever they are installed. Using capacitive touch, sunlight readability and night vision settings, these displays are continuously vibrant and beautiful. Perhaps the largest benefit of Poseidon is its remote access feature. Connect to your Poseidon system wherever you are; on mobile, tablet or PC, you can take Poseidon with you. The system has optional PIN access, to set different levels of permissions to its users. Control who can see displayed data or control systems by simply assigning their role thus ensuring full security. Oceanic Systems’ new vertical Dual Engine Display provides a sleek and modern single display to replace the two original engine manufacturer’s displays at a lower cost without compromising the engine manufacturer’s warranty. The unit is switch selectable between engines from Caterpillar, Cummins, MAN, MTU, Volvo, Yanmar and many others. It has been tested with all the available engine manufacturers’ error messages to ensure that they are displayed accurately. The unit is also switch-selectable between SI and American display units. The 4166 also displays fuel tank contents from 1 to 4 tanks, the current rudder angle, GPS time and the GPS Compass if there are no error messages to display. Certified to work with both J1939 and NMEA2000® devices the Dual Engine Display provides a modern and clean single display instead of the bulkier and more old fashioned separate engine displays. Oceanic Systems’ new Multiple Engine Display provides a sleek and modern single display to replace the multiple original engine manufacturer’s displays at a lower cost without compromising the engine manufacturer’s warranty. The Multiple Engine Display, Part No 4161, has both J1939 and NMEA2000® built-in interfaces that displays all the important engine data in real time and accepts and displays engine manufacturers published error messages if they occur. It also displays from 1 to 4 fuel tank levels, the rudder/steering angle indicator and a GPS CompassRose and local GPS time from the NMEA2000® network. Certified to work with both J1939 and NMEA2000® devices the Mulitple Engine Display provides a modern and clean single display instead of the bulkier and more old-fashioned separate engine displays.